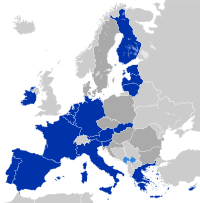 By majority approval of the European Council. The President of the European Central Bank is the head of the European Central Bank (ECB), the institution responsible for the management of the euro and monetary policy in the Eurozone of the European Union (EU). Wim Duisenberg was the President of the European Monetary Institute (EMI) when it became the ECB, just prior to the launch of the euro, on 1 June 1998. Duisenberg then became the first President of the ECB. The French interpretation of the agreement made with the installation of Wim Duisenberg as ECB President was that Duisenberg would resign after just four years of his eight-year term, and would be replaced by the Frenchman Jean-Claude Trichet. Duisenberg always strongly denied that such an agreement was made and stated in February 2002 that he would stay in office until his 68th birthday on 9 July 2003. In the meanwhile Jean-Claude Trichet was not cleared of legal accusations before 1 June 2002, so he was not able to begin his term after Duisenberg's first four years. Even on 9 July 2003 Trichet was not cleared, and therefore Duisenberg remained in office until 1 November 2003. Duisenberg died on 31 July 2005. Jean-Claude Trichet became President in 2003 and served during the European sovereign debt crisis. Trichet's strengths lay in keeping consensus and visible calm in the ECB. During his tenure, Trichet has had to fend off criticism from French President Nicolas Sarkozy who demanded a more growth-orientated policy at the ECB. Germany supported Trichet in demanding the bank's independence be respected. However, he was also criticised from straying from his mandate during the crisis by buying the government bonds of eurozone member states. ECB board members Axel A. Weber and Jürgen Stark resigned in protest at this policy, even if it helped prevent states from defaulting. IMF economist Pau Rabanal argued that Trichet "maintained a relatively expansionary monetary policy," but even "sacrificed the ECB's inflation target for the sake of greater economic growth and jobs creation, and not the other way round." While straying from his mandate, he has however still kept interest rates under control and maintained greater price stability than the Deutsche Bundesbank did before the euro. As well as defending the ECB's independence and balancing its commitment to interest rates and economic stability, Trichet also fought Sarkozy for automatic sanctions in the EU fiscal reforms and against Angela Merkel against private sector involvement in bail outs so as not to scare the markets. He had however made some mistakes during the crisis, for example by: raising interest rates just after inflation topped out and just prior to the recession triggered by the Lehman Brothers collapse; also by its early timidity in buying eurozone state bonds. Although Axel Weber was tipped as one of the possible successors, he resigned from the ECB in protest at the bail out policies. Mario Draghi was chosen to become the next President of the ECB on 24 June 2011. He is President since 1 November 2011. Pascal Canfin, Member of the European Parliament, asserted that Draghi had been involved in swaps for European governments, namely Greece, trying to disguise their countries' economic status. Draghi responded that the deals were "undertaken before my joining Goldman Sachs [and] I had nothing to do with" them, in the 2011 European Parliament nomination hearings. List of presidents since the establishment of the bank on 1 June 1998. Previously the Dutch Minister of Finance, President of De Nederlandsche Bank and President of the European Monetary Institute. Previously a member of the Group of Thirty and the Governor of the Banque de France. Previously a managing director of Goldman Sachs, executive Director of the World Bank, Chairman of the Financial Stability Board and Governor of the Banca d'Italia. Vice President Christian Noyer was only appointed for four years so that his resignation would coincide with the expected resignation of Duisenberg. His successors, starting with Lucas Papademos, are granted eight-year terms. Previously a civil servant, advisor and head of the treasury at the French Ministry of Finance. Previously the senior economist at the Federal Reserve Bank of Boston chief economist and then Governor of the Bank of Greece. Previously secretary-general of the Socialist Party and Governor of the Banco de Portugal. Previously Minister of Economy and Competitiveness of the Government of Spain. ^ Atalaia, Rita. "Constâncio ganhou 340 mil euros no último ano no BCE". ECO. Retrieved 22 February 2018. ^ "New ECB chief 'must be French'". BBC, Friday, 8 February 2002. Retrieved 9 April 2012. ^ Murphy, Francois (23 September 2007). "Trichet brushes off French criticism of ECB". Reuters. Retrieved 26 June 2011. ^ Randow, Jana (9 February 2011). "Weber Throws ECB Race Open by Ruling Out Second Bundesbank Term". Bloomberg. Retrieved 26 June 2011. ^ Baker, Luke (24 June 2011). "EU leaders appoint Mario Draghi as new ECB president | Reuters". Uk.reuters.com. Retrieved 26 June 2011.